Established in 1947, ISO established a standard for country and currency pair abbreviations. Since foreign currencies are quoted in terms of value of one currency against another, a currency pair consists of an acronym for both currencies, separated by a slash "/". There are many other currency pairs available to trade, such as the Danish Krone, Mexican Peso, and Russian Ruble. However, these pairs are generally traded less, and for these pairs, it is harder to find buyers and sellers. Such currency pairs are called "exotics". Because they have less volume and involve a higher risk for the broker, they typically have a wider PIP spread. Market increments are measured in PIPs, or Percentage in Point. 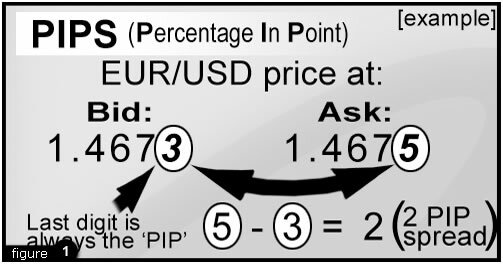 A pip is the last digit in the value of a currency pair; 1.3294, 115.13 etc. All currency pairs, except for the Japanese Yen, have 4 decimal places. The Yen crosses only have 2 decimal places. For example, let's assume a trader buys 1 standard lot of GBP/USD. The current market rate is 1.9615. Essentially this trader is buying EU 100,000 in exchange for $196,150. Again, for examples sake, assume the market rate rose 15 PIPs to 1.9630 and the trader liquidates the position. The same Bu 100,000 is now worth $196,300, the trader realizing a $150 profit.